Post: Gaurav Akrani. Date: 2/15/2012. No Comments. Label: Finance. 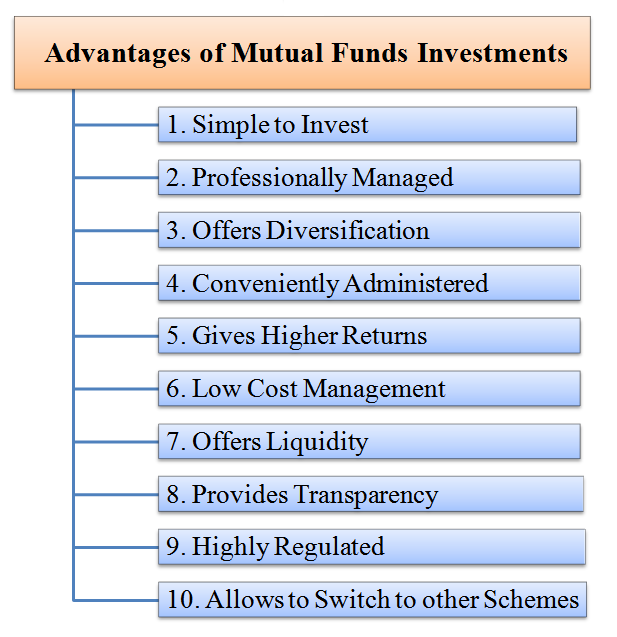 The ten main advantages of mutual funds are depicted below. Mutual funds are simple to invest in. Allows switching to other schemes. Now let's continue to discuss above benefits of mutual funds. Investment in mutual fund is simple as compared to other available investments in the market. The minimum investment required is pretty less. SIP (Systematic Investment Plan) can start with a contribution of say just $10 (approx. INR 500) on a monthly basis. Furthermore, most of the schemes of the mutual fund have an automatic reinvestment plans. Mutual funds are managed by skilled and professionally experienced managers with a backup of a research team. The fund managers help to channel the funds in the best available growth opportunities. Investors purchase mutual fund because they do not have a time or the expertise to manage their own portfolio. A fund manager on their behalf helps to resolve such issues. Mutual fund offers diversification in a portfolio which reduces the risk of fall in a value of investments. Purchasing units in a mutual fund is a best option, instead of buying individual stocks or bonds. The investment risk is spread out and minimized up to a certain extent. The basic idea behind diversification is to invest in a large number of assets so that a loss in any particular-investment is minimized by gains in other investments. In mutual fund, there is no administrative risk of share transfer, as many funds offer these services in their Demat trading accounts, which finally save investor's time. These proper and prompt services help the investor to grab the available growth opportunities. Investor usually gets higher returns in mutual fund as compared to other avenues of investment. There are various schemes of mutual fund offered by, HDFC, ICICI, Franklin Templeton, etc. They have provided excellent returns. However, investors have to be cautioned that such high returns are not to be taken as consistent and regular returns. As per the policy of the various statutory authorities, the organizations operating the mutual fund can only shift certain prescribed percentage of cost on the investors. The extra cost incurred such as management expenses has to be borne by the organization. An operating cost of mutual fund is considered to be relatively less expensive. Since, it buys and sells large amounts (quantity) of securities at a time, this helps in reducing transaction costs. Thus, mutual fund assures low cost management. A mutual fund can be easily liquidated at the request of an investor. Just like an individual stock, it also allows investors to liquidate their holdings as and when they feel it necessary. Statutory authorities have compelled all the mutual fund companies to disclose their Net Assets Value (NAV). The NAV is calculated on daily basis and are regularly published through the available media. Thus, mutual fund companies disclose their financial statements to their investors and to others. Mutual funds all over the world are highly regulated. The fund manager has to submit all necessary documents to the statutory authorities for their approval, to make investment in the required securities. Mutual fund gives an option to an investor, to switch to other schemes whenever they like, without any charges. This helps the investor to take benefit of the various available schemes which will finally help him/her to maximize returns on investment. The prime motive of mutual fund is to give small investors an access to invest in the stocks, bonds, shares and other securities. Without it, it would be impossible for them to invest in such financial securities with limited funds. Furthermore, mutual funds are professionally managed to mitigate (reduce) the probability of risk, to a certain extent. What is Corporate Finance? Meaning - What it Includes? Different Types of Banks - What are Various Kinds of Banks ? What are the Advantages of Opening Bank Account ? How to Improve Human Relations?